Vladiimir Suzdalevich was born in 1971. After completing his organ studies at the St.Peterburg Conservatory he began to play in different churches in Norway, where he lives now. 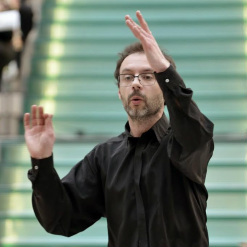 He completed his Master’s Degree in choral conductingbn in the Norwegian Academy of Music, Oslo. In 2005 he became a teacher in the Far-Eastern State Academy of Arts, Vladivostok. Vladimir gives many organ concerts both in Norway and abroad, as well as performing early and contemporary pieces with his choir.